postcrossing | Random moosages as I see fit. 1) USPS has increased postage prices. This was inevitable and it isn’t really big news. What I did want to comment on is the fact that the USPS has finally come out with an international forever stamp. I like this a lot. As you may know, I am a member of postcrossing…partly because I like postcards and partly because I like used stamps, although I do not consider myself a deltiologist or a philatelist. Anyway, it has been rather annoying with the increase in postage rates because I would forever be trying to cram more stamps onto a postcard. Postcards do not have much real estate for stamps. I mean, you have to fit a short message, an address, and stamps all into a space generally about 4″x6″. But you can’t use all of that space because normally there’s some description of the front side of the postcard printed in that same space and the USPS needs some room to affix those bar code things to help with sorting, etc etc. or maybe some numbers here. Do you know how hard that is to fit onto a postcard? It is EXTREMELY DIFFICULT. It does not help when you also have to fit 23098923874 stamps into that same space, the last 29837192 of which are 1 and 2 cent stamps to make up the difference with the postage increase. Welp, now I don’t have to. Because I have purchased some of these newfangled forever stamps for international mail! Huzzah! And actually, what I like best about them is the fact that they’re circular, BUT STILL HAVE THE PERFORATION MARKS on the edges. Think about that. Think about if they were really released where you would have to tear out stamps from a sheet (or a roll). It would be a sheet of all these perforated circles. Think of how ridiculous that is. As it is, I really like the design. Complete with the perforation marks. Also, it doesn’t bother me as much as I say it does to try and fit 129387192837 stamps and then an address on a postcard. I was trying to be dramatic. And did you know the Royal Mail serving the UK actually is pretty efficient despite those really strange addresses? It’s kind of amazing. 2) The USPS recently declared that they will no longer deliver first-class mail on Saturdays starting in August. This…I kind of also feel was inevitable. Because Congress is stupid. Yes, I truly believe that. I mean, the people elected for Congress may be smart individuals (or may not be, which I also think is increasingly the case BUT I DIGRESS), but as a group they’re incredibly stupid. Why are they making the USPS pre-fund their retiree health benefits? No one else does it. And since Congress won’t back down on that, it was inevitable that something would have to go. So the USPS opted to stop delivery of first class mail on Saturdays. It’s supposed to save them about 2 billion a year. Now then, I am disappoint that this is happening but, in the end, it’s not that big of a deal. The USPS will still deliver packages on Saturday and that’s the important thing. Some people get their meds via USPS and it’s important for them to still receive their packages. Also, I shop online…almost exclusively. If it’s a choice, I’ll almost always go for USPS delivery or the joint parcel carrier/USPS thing because I don’t have to pay extra for Saturday deliveries with the USPS. Also because I like the USPS. The the thing that affects me most and the thing that affects the elderly the most? It’ll still be there. Now as for first class mail, I would really like for the USPS to continue delivering it on Saturdays. But if they don’t, it’s ok. I do correspond, probably more than the average person, with others by written letters and the like. I would like to get my letters on Saturday, if possible. But if I can’t, well I still have FIVE OTHER DAYS to receive mail. And I don’t always have the time to read my mail and respond to it on weekdays. So now I can use the weekend to read and respond to mail and send it out on Monday. It’s not a big change from before. So this woman? I have no idea why she’s so upset. She doesn’t say anything in her argument that shows why Saturday delivery for first class mail is so important. In fact, her argument seems to support stopping Saturday delivery for the very same reason I stated above. Actually, most arguments that I’ve seen are to this effect. Hallmark complains that now people will be sad because they won’t be able to get greetings cards on Saturdays. Because…Monday is too much of a wait for the recipient? Or the sender is too much of a slacker to mail the card in time for Friday delivery? It’s not that hard people. Just pop the card into the mail one day earlier. Another argument I saw was that small businesses sending out flyers for sales and stuff would now also have to try and get their flyers in the mail earlier (I can’t find the link to this story, sorry). Well, this argument doesn’t make sense to me either. If the sale is on Saturday, and many sales are over the weekend when people have time to go shopping, you wouldn’t want your flyers to arrive in the mail that Saturday. How would that be enough notice? Friday might not even be enough notice. I don’t see how ending Saturday delivery hurts said small business because no one knew about their sale. If the sale is on Monday…well, who has sales only on Mondays? Normally it’s a three-day affair over the weekend and into Monday. This isn’t a good argument. Same deal with magazine subscriptions. Ending Saturday delivery doesn’t really hurt them. If people get the magazine during the week and don’t have time to look through it, well now they have something to look forward to for the weekend. Why do they keep whining? 3) This isn’t related to the USPS as much, but it kind of us. Did you know that February is Lettermo? I do have one postcard that is half made and needs to get sent out to a lettermo participant. More on that later. 4) One more that’s somewhat related to the USPS. Did you know Belgium is releasing chocolate-scented and chocolate-flavored stamps? The USPS should definitely get on this. I’m sure if they were to release chocolate-scented, chocolate-flavored stamps, nigh everyone would buy some and solve the funding crisis. Totes. It’s another postcrossing postcard. This one is to NorCal and the recipient said that he liked landscape postcards. I had a very nice one of the Yukon…but I can’t find it. Sugh. That seems to be the way it always is. 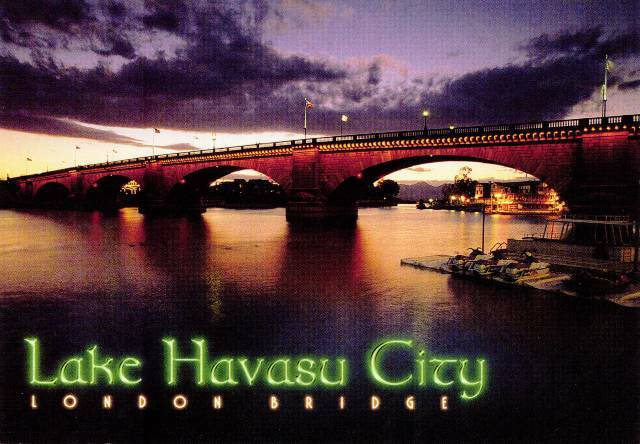 Anyway, since I figure he already knew what California looks like, I sent a postcard of the London Bridge in Lake Havasu instead. This one might be the last one I have of the London Bridge in Lake Havasu. It’s the actual London Bridge…but it’s the 1800s London Bridge. The city of London sold the bridge in the mid-1900s when it was no longer able to support the amount of traffic over the bridge. Arizona bought it and installed it over part of Lake Havasu.